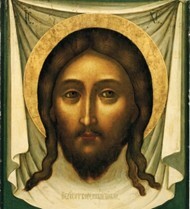 Icon/Mural Paintings By Muscovite Painters, Simon Ushakov. For earlier styles of Medieval painting in Russia, please see our article on the Novgorod School of Icon Painting (1100-1500). For later painting styles from the 17th century, see: Petrine art (1686-1725) in St Petersburg, under Tsar Peter the Great. This introduced Russian Painting (18th century), dominated by religious murals and portraiture. After this, the modern school emerged: please see Russian Painting (19th Century). an early master of the Muscovite School. From Kiev, the home of Russian medieval painting, the centre of gravity of Russian art shifted to Novgorod (as well as Yaroslavl, Vladimir-Suzdal, Pskov and Tver) before settling in Moscow. By the sixteenth century, the great interest the Muscovites took in mundane affairs loosened the ties which had so far knit the Russian people and church into a single entity. Religion still stood at the basis of Muscovite life, but henceforth both the Crown and the people tended to react to events differently from the clerics, and although all remained for the time unconscious of the split, the effect of the layman's more worldly outlook can be clearly perceived in the decreased religious intensity of Muscovite icon painting. The appearance in Moscow of large numbers of Western religious etchings likewise had an important impact on icon-painters, increasing their doubts as to the need for the severe limitations which the old iconographic tradition imposed upon their art. NOTE: For the greatest icon painters before the Moscow school, see: Theophanes the Greek, Founder of Novgorodian school; Andrei Rublev, noted for the Holy Trinity Icon (c.1416); and other Medieval Artists (1100-1400). These doubts came to a head in the sixteenth century as the indirect result of a fire which devastated Moscow in 1547. It destroyed so many of the capital's icons that the Tsar was obliged to borrow icons from Novgorod, Smolensk, Dmitrov and Zvenigorod, and as he was anxious to return them to their homes as soon as possible, he strengthened the ranks of Moscow's icon-painters by also borrowing artists from Novgorod and Pskov, Between them the painters he employed produced some excellent panels, and all might still have been well with the future of icon-painting, but for the interference of a bigoted priest, clerk to the Tsar's council and himself no mean painter, named Viscovati. It is tempting to ascribe Viscovati's intervention to professional jealousy, aggravated by a warped and prejudiced mind somewhat akin to that of John Knox, the Scottish Reformation preacher. Whatever his reason, Viscovati criticized the panels of Christian art produced by his contemporaries on religious grounds, claiming that they deviated from iconographic tradition. He demanded that the second Stoglav council be summoned to sit with Silvester, Ivan IV's favourite cleric, to examine the icons from an ethical standpoint. Compliance with this request introduced official, as distinct from traditional, control over icon-painters, who were henceforth expected to adhere to the authorized versions of religious scenes as recorded in the ancient manuals called "Podliniki" (Authentic versions). The irritation of Russian artists at thus having to exchange deference to traditional opinion for obedience to rigid ecclesiastical legislation turned to annoyance when they found that the very clerics who were most thorough in enforcing adherence to the "Podliniki" did not object to the newly introduced art of portraiture (that is, non-religious portrait paintings known as Parsunas), and that even the patriarch Nikon, though he was bitterly opposed to the naturalism of Western religious art and continually confiscated and burnt examples of Western religious painting, nevertheless more than once sat for his portrait. The first Russian equivalent of an Academy of Fine Arts took the form of workshops established in the Palace of Arms by Ivan IV, nicknamed the Terrible (1533-1584). The finest Muscovite paintings, illuminations and metalwork were created by the artists employed there, many of whom were greatly attracted by Western naturalism. Nevertheless, these artists succeeded in producing sufficient icons of quality during the later half of the sixteenth and the first quarter of the seventeenth centuries to constitute a distinctive and highly creditable school of Muscovite icon-painting. These panel paintings - typically executed in tempera rather than the older encaustic paint, or more modern oils - are easily recognizable by the profusion of detail in their exceedingly decorative backgrounds. The abundance of architectural features is especially characteristic, as well as the fact that these buildings reproduce contemporary architectural trends instead of imaginary outlines. On the other hand, such non-Russian features as, for instance, mountains, are handled purely decoratively instead of either naturalistically or in the traditional manner. The saints have the round faces of Muscovites, but the colours of their robes, though still pleasing, cannot compare with the magnificent vitality of the colour schemes used by the Novgorod school of icon painting, and tend to be dull and metallic. Broadly speaking, the full extent of Moscow's colour palette ranges from blood-reds and yellows to browns, with black shadows. It was towards the end of the sixteenth century that two nephews of the first Stroganov to settle in Solvychegodsk decided to establish an icon-painting workshop of their own there. Both Stroganov brothers were talented amateur icon-painters, and both were men of very great taste. It fell to them to furnish the incentive which inspired the final great spurt in Russian icon-painting. The brothers were great admirers of Novgorodian painting, and the artists they employed probably derived their sense of style and colour, their love of white highlights, and the elegant elongation of their figures from a study of Novgorodian work. The workshop's output soon attracted widespread notice and admiration, for in their day no finer icons were produced in Russia. Nevertheless the connoisseurship which inspired them places these icons in a class of their own, for although the Stroganov painters approached their tasks with a devout spirit, their sophistication and their preoccupation with asthetics left no room for the intense religious fervour which was as essential for the production of a truly fine icon as was first-rate workmanship. Technical skill is the prime appeal made by the Stroganov icons; to be appreciated they have to be examined closely, like a Persian miniature. In their mass of tiny detail they are akin to the medieval illuminated manuscripts of Western Europe, yet they lack the directness of such miniatures, and can perhaps be more aptly compared to the detail in the work of pre-Raphaelite painters. Muratov dates the Stroganov workshop's output to the years from 1580 to 1620, for he considers that the style ended with the death in 1621 of its greatest exponent, Procopius Chirin. Although Chirin is the school's acknowledged master, Nicephorus Savin does not fall far short of him. The latter's icon of St. John in the Desert is a superb piece of precise painting. A close examination of its elaborate background - which can stand the test of enlargement to any size - reveals a scene as fascinating in its way as any created by the Netherlandish painter Hieronymus Bosch. Savin's brother Nazarius, together with his assistant Arafiev, were the first Stroganov artists to attract Moscow's attention by means of the fresco paintings which they produced in 1580 for Solvychegodsk Cathedral. As a result of this, many of the workshop's artists were summoned to Moscow to work for the Tsar, notably Simon Borozdin, Ivan Sobelev, Mihailov, Emilyan Moskvitin, and the brothers Nicephorus and Nazarius Savin and Istom Savin, to name but a few. Many of them were honoured with the title of "Royal Icon Painters", one usually conferred only upon the Palace of Arms artists. Boris Godunov (1551-1605) fully appreciated the decorative quality of the Stroganov artists' work, and in 1591 he employed Nazarius Savin, Procopius Chirin and John Parseni to decorate his bedroom and dining-room at Kolomenskoe with secular scenes. It is much to be regretted that no record of this work survives, for Russian art is thus the poorer by the loss of some of its earliest, and probably its most successful secular paintings. Both Boris Godunov and his son Fedor were great picture lovers, valuing them on aesthetic grounds, and not only because of their content, and it was they who arranged for the Palace of Facets to be decorated by the Palace of Arms painters. It is again much to be deplored that these paintings have also perished; all that is known about them is that their subject-matter ranged from the biblical to the allegorical, and included scenes from Russian history. In addition to sponsoring decorative art, both Boris and Fedor encouraged portrait art. Portraits were by no means unknown to medieval Russia, for as early as the twelfth century figures of donors occasionally appeared in Novgorodian frescoes. On the whole, however, they were considered profane, and although Sophia Paleologus had sent her prospective husband her likeness, Ivan IV was the first Tsar to be enthralled by portraiture. He, however, satisfied his interest by indirect means rather than by patronage - that is to say, by collecting around him the portraits of the various European royalties whom he toyed with the idea of marrying, and it was left to Godunov to be the first royal sponsor of portraiture in Moscow. With the second Romanov, Tsar Alexis (1645-1676), portraiture became customary, but the Russian painters could not break free from the old tradition, and their renderings of likenesses still savoured strongly of the iconographic. A desire for complete naturalism was, however, growing, and, as a result, towards the middle of the seventeenth century a number of foreigners were enrolled in the Palace of Arms studios. The most distinguished among these was the gifted German, Hans Detterson, who trained the two foremost Russian painters of the period, Abramov and Stepanov. A Polish charlatan was also employed, who succeeded in bamboozling Moscow for a time, The promising youths, Ivan Bezmin and Ermolin, had the ill luck to be apprenticed to him. The Dutchman, Daniel Vuchters, Hans Waiter of Hamburg, the decorative artist, Peter Engels, the Swedish perspective painter, Gul, and G. E. Grube of Hamburg, were the more notable westerners who taught in Moscow between the years 1667 and 1694. Simultaneously the Palace of Arms workshops maintained touch with Byzantine art by employing as teachers a renegade Arab calling himself Sasha Yakovlev, an Armenian called Saltanov and two Greeks, who were known by the names of Yuriev and Salomoriov. But none of these teachers exercised anything like the same influence as the etchings which were percolating into Moscow from Western Europe. The most important of these appeared in Piscator's Bible, published in Amsterdam in 1650, It was illustrated by nearly three hundred woodcuts copied by Piscator, alias Jan Visscher, from the works of Western artists. The woodcuts disclosed a new world to the Muscovites, revealing the full power of naturalistic painting, and their influence is apparent in the work of more than one painter. Simon Ushakov (1626-1686) was the most outstanding of the painters thus affected. He was obviously fascinated by Western religious paintings, for he was tempted to try his hand at producing naturalistic illustrations to the Scriptures. His achievements in this sphere were thoroughly successful; were they better known Ushakov would certainly be numbered among Europe's great draughtsmen. His fine woodcut depicting Man's Seven Deadly Sins is full of the vigour and conviction which are unfortunately lacking in his icons. Yet Ushakov is mainly known for his icons, which have always been greatly admired in Russia. Indeed, his contemporaries had so high a regard for his genius that Ushakov had the signal honour of being appointed "Court Painter" at the unusually early age of twenty-one. This unfortunately meant that he had to devote a good deal of time to icon-painting. 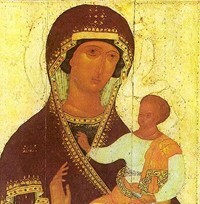 His icon of the Virgin of Vladimir (1652); his Christ (1657) and his Annunciation (1659), though ranking as his best icons, are marred by excessive humanism and sentimentality, and suggest that Ushakov was too preoccupied with naturalism to be able to devote himself heart and soul to icon-painting. Though his panels are strictly iconographic yet they prove Ushakov to have been an icon-painter of compromise, and this very ability to compromise resulted in his icons serving as models of perfection from the turn of the seventeenth century to as late as the middle of the nineteenth. The earliest surviving piece of Russian writing on aesthetics indicates that Ushakov's shortcomings as an icon-painter were not caused by incompetence or insincerity, but were due to his sympathy for Western naturalism. This important document was written by an icon-painter called Joseph, and dedicated by him to Ushakov in memory of their many talks on art matters. Joseph wrote as a passionate advocate of Western religious art, attacking the retrograde clergy for killing the inspiration of creative artists whilst encouraging hack painters. "Would you lay down," he hotly inquired of them, "that only Russians be permitted to paint religious pictures and that the Russian icon is alone to be venerated, whilst Western ones be spurned and never used for worship? Know then that in foreign lands not only are Christ and the Virgin depicted realistically, but that their features are cleverly reproduced on sheets of paper, and whenever we icon-painters see either printed or skilfully painted likenesses of Christ or the Virgin whether in the possession of foreigners or of our own people, our eyes are filled with exceeding love and happiness, nor are we inflamed with jealousy, nor do we revile the foreigners because we see them in possession of well painted religious pictures. On the contrary we esteem such blessed objects above all worldly chattels, and we lovingly either purchase them or beg for them as gifts of inestimable value, and we receive Christ's image with veneration, and kiss it lovingly. Whence comes it then that we are now instructed to represent all saintly faces as swarthy and sombre? Is it that the human race is cast in a single mould? Were all saints dusky and haggard looking?" Joseph proceeded to plead for permission to depict saints as physically beautiful, and reminded the clerics that God referred to "the good as fair and comely, the evil as dark, bloody and emaciated", and recalled that when Moses descended from Sinai afier hearing God's words "none could look upon him, such was the radiance of his countenance". Although we do not how how Ushakov reacted to this appeal, his superb woodcuts shows that he was in sympathy with many of Joseph's views, and there are suggestions that he welcomed every opportunity to work on anything but icons. He appears to have spent a good deal of his time designing gold-and-enamel church vessels in the Palace of Arms metal workshops, and he is also known to have decorated firearms, and drawn maps and plans. Certain contemporaries refer to his paintings on paper, but give no information about their subjects or style, so Ushakov's reputation as an artist rests today on his panels, frescoes and woodcuts. Moscow's cathedrals and churches were sumptuously decorated with wall-paintings executed by her leading icon-painters in a style so closely akin to their icons that there is no need to examine them closely in a general survey. Attention must, however, be called to a large group of curious and attractive wall-paintings produced between the years 1670 and 1695 in the provincial centres of Yaroslavl and Kostroma. The vast churches in these districts, such for example as the church at Tolchkovo (1694) or at Romanov Borisoglebsk (1692), were entirely covered with wall-paintings. The churches were so numerous and so large that most of the mural painting was hurried, and the result is often rough and unpolished, but it is at the same time so individual and so attractive that this murale murals cannot be dismissed as worthless. The best of the Moscow style of painting is blended in them with the new conceptions evoked by Piscator's woodcuts, and this result is dominated by the superb feeling for colour and decoration and the innate sense of spacing and presentation so characteristic of the work of Yaroslavl, to be seen alike in the toys, embroideries, ceramics and painting produced in that centre. Like the earlier Muscovite icons, these wall-paintings abound in elaborate architectural backgrounds featuring buildings in the Muscovite style, The saints have round, central-Russian faces, and their robes as well as the backgrounds are brilliantly and gaily coloured. The wall-space which the paintings had to cover was so vast that a number of new iconographic scenes had to be evolved to provide the painters with the necessary subject-matter, The fact that many of the new scenes were taken from Piscator's Bible is an indication of the interest which Russia as a whole, the provinces no less than Moscow, took in both Early Renaissance painting (c.1400-1490) and High Renaissance painting (c.1490-1530). But although the Yaroslavl and Kostroma painters drew their material from Piscator, it never occurred to them to reproduce his woodcuts in their original form, for none of them was a servile copyist. All automatically transposed Piscator's scenes into essentially Russian compositions painted in a style which reveals a surprising kinship with the designs produced today in the Palekh papier mache workshops sponsored by the Soviet Government. If space were available it would be interesting to discuss this unexpected resemblance between the seventeenth century's Byzantine-esque interpretations of Western religious art and the twentieth century's secular scenes produced by the last surviving community of hereditary icon-painters. All we can do here, however, is to draw attention to the resemblance. It is, for example, clearly evident in a wall-painting from 1691 of David fighting the Bear in the church of St. John the forerunner in Yaroslavl, which is derived from Piscator's rendering of an etching by Bonse, dated to 1608. The similarity is still more marked in a scene from the life of Elisha dated to 1681 in the church of the prophet Elijah at Yaroslavl. Piscator's woodcut, dated to 1640, was based on Martin de Foss's life of Elisha. The Yaroslavl version differs markedly from Piscator's, but its grouping and colouring, especially the juxtaposition of the brilliantly yellow corn, the intensely blue sky and the bright pink and red blouses of the reapers, might have been produced by a modern Palekh artist illustrating Pushkin. Yet, for all their charm and interest, these wall-paintings fall as far short of inspired art as do the delicate, accomplished and sophisticated Stroganov icons and the outstandingly decorative panels executed in the Palace of Arms workshops. We must conclude that although Moscow produced a class of art-lovers whose high critical standards and powers of quick appreciation played their part in the surprisingly rapid development of Russia's eighteenth-century Westernized art, she was psychologically unequal to inspire work of the same high quality as Novgorod. Paintings reflecting the style of the 16th/17th century Moscow school can be seen in some of the best art museums in Russia, notably the Novgorod Arts Museum and the Tretyakov Gallery, Moscow.  For the meaning of important Russian frescoes and tempera pictures, see: Famous Paintings Analyzed.  For information about Muscovite painting and sculpture, see: Homepage.